Progeria is a rare genetic disease characterized by early aging of the child. 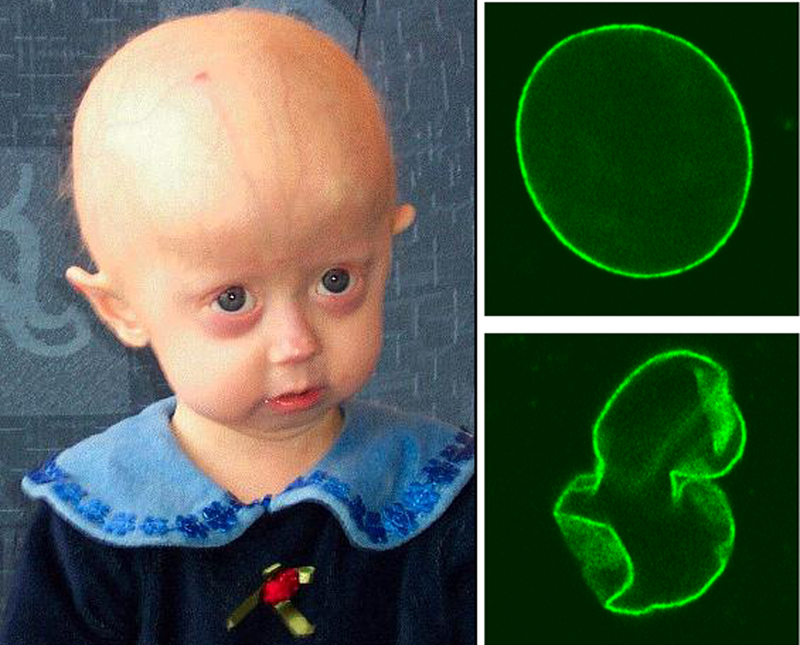 Progeria, also known as Hutchinson-Gilford syndrome, is a rare genetic disorder. It is characterized by an increased aging of the body. Children with this pathology have early features of old age. At birth, the child has no abnormality. It looks “normal” until early childhood. Gradually, his morphology and his body develop abnormally: he grows less quickly than normal and does not take the weight of a child his age. In the face, development is also backward. It has prominent eyes (raised, strongly advanced), a very fine and crooked nose, thin lips, a small chin and ears removed. Progeria is also responsible for significant hair loss (alopecia), aged skin, joint deficiencies, or loss of subcutaneous fat (subcutaneous fat). The cognitive and intellectual development of the child is not usually affected. It is essentially a deficiency and consequences on motor development, causing difficulties to sit, stand or walk. Patients with Hutchinson-Gilford syndrome also have narrowing in certain arteries, leading to the development of atherosclerosis (obstruction of the arteries). However, arteriosclerosis is a predominant factor in an increased risk of heart attack, or stroke . The prevalence of this disease (number of people reached among the total population) amounts to 1/4 million newborns in the world. It is therefore a rare disease. Since progeria is an inherited autosomal dominant disease, the individuals most at risk of developing such a disease are those whose parents, too, have progeria. The risk of random genetic mutations is also possible. Progeria can then affect any individual, even if the disease is not present in the family circle. Progeria is a rare and genetic disease. The origin of this pathology is mutations within the LMNA gene. This gene is at the origin of the formation of a protein: Lamine A. The latter plays an important role in the formation of the cell nucleus. It is an essential element in the formation of the nuclear envelope (membrane surrounding the nucleus of the cells). Genetic mutations in this gene lead to the abnormal formation of Lamine A. This abnormally formed protein is responsible for the instability of the cell nucleus, as well as the early death of the cells of the body. Scientists are currently asking the question, to obtain more details on the involvement of this protein in the development of the human body. Genetic transmission of Hutchinson-Gilford syndrome occurs as part of an autosomal dominant inheritance. Either the transmission of only one of the two copies of the specific gene (either from the mother or from the father) is sufficient for the disease to develop in the child. Moreover, random mutations (not resulting from a transmission of parental genes) of the LMNA gene can also be at the origin of such a disease. Narrowing of the arteries, a major risk factor for arteriosclerosis. Since progeria is a rare autosomal dominant genetic and hereditary disease, the presence of the disease in one parent is the most important risk factor. The symptoms associated with progeria are progressive and can lead to the death of the patient. No cure for the disease is currently available. The only management of progeria is that of the symptoms. Research is then in the spotlight, to discover a treatment for healing such a condition.